"No bikes allowed/No cycling on the trail"
'No cycling' would mean you are not allowed to ride a bike. 'No bikes allowed' would mean no bikes, whether you ride them or not. Would you use "Biking forbidden", too? No. I have never seen that phrase. Also, "biking" is often used to mean "motorcycling." Bike, biking, and bicycle, all refer to vehicles with two wheels. But there is also the four-wheeled vehicle, the quadbike, which has 4 wheels. No. Biking does not generally mean cycling. It commonly means motorcycling. 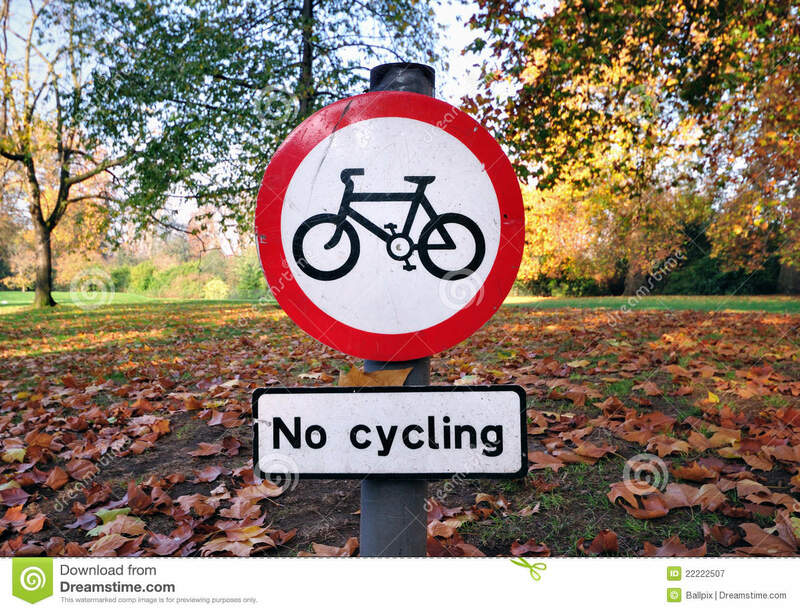 In BE the normal sign is "no cycling". This link should take you to a typical "no cycling" sign. Yes, I agree with Loghrat - give me a 'No cycling' sign, and you will see a good, law-abiding citizen like myself conscientiously pushing his bike along, not riding it. I see 'CYCLISTS DISMOUNT' signs as well, like here or here. In the US, "no biking" is much less common than "no bikes" or "no bicycles," but it would certainly mean "no bicycles" and not "no motorcycles." We would say "no motorcyles" to mean that. Of course, 95.3% of such signs don't have any words at all on them these days.